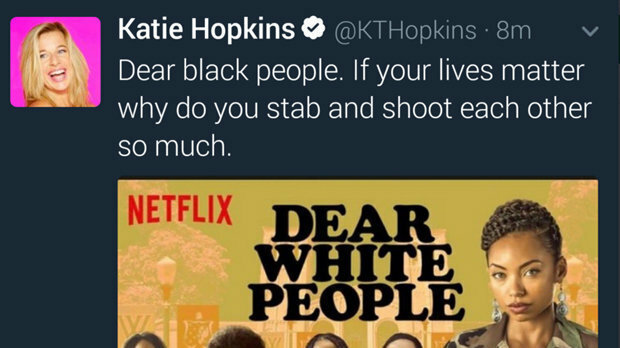 Katie Hopkins has disgusted Twitter users after sending out a tweet attacking the Black Lives Matter movement. 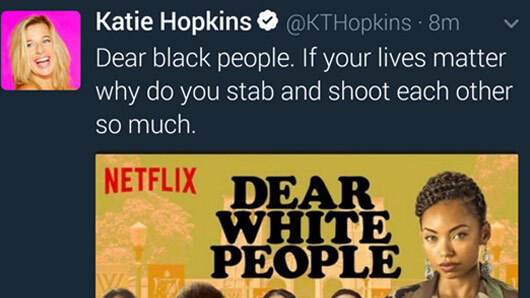 The controversial television personality and newspaper columnist has sparked extreme backlash on social media after supposedly tweeting about the show Dear White People. The post was later deleted and, despite there being screenshots from a few people on Twitter, it has yet to be confirmed whether the post was actually sent by the 42-year-old herself. Netflix’s Dear White People follows American students at the predominantly white Ivy League college as a group of a black students navigate various forms of racial discrimination. The show was released onto the streaming site at the end of last month and has received a 100% Fresh score on Rotten Tomatoes. Dear White People is now available to watch on Netflix.